"Excellent movie!! Why hasn't this been pubilized? This is a world wide concern. Plus it's a good movie." "Beautiful movie. Wish that there was some advertising for it cause its something everyone should see." "Kevin Richardson and Gilles de Maistre did a phenomenal job getting this movie made. 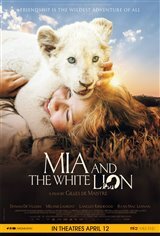 It's perfect for families, adults or children to enjoy and learn about plight of captive lions in South Africa. The land is beautiful and the acting truly pulls you into the story. This movie is well worth seeing!"